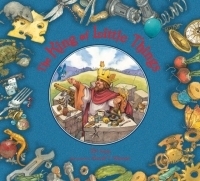 Long ago in a faraway realm, the King of Little Things ruled happily over all things small?from buttons to beetles, from marbles to macaroni. When King Normous thinks he has finally become the ruler of all the world, he is enraged to learn that the King of Little Things still reigns happily in his tiny kingdom. Normous sends his army to defeat this upstart, but he finds he cannot outfight or outwit a king who holds sway over the little things of the world. After all, it is the little things that keep the big things going. First of all the illustrations are absolutely beautiful! It was so much fun looking at all the pictures with my children and finding objects with each reading. The story itself is a wonderful lesson. King Normous decides he wants to rule the entire world and in order to do that he needs to make war on The King of Little Things. King Normous thinks little things don't really matter, but what he doesn't realize is how when little things work together, they can cause HUGE havoc! The King of Little Things is a kind man. A king who not only loves the little things, but his life and his Queen. The little things will do anything for him, and that's shown throughout the book. What a wonderful way to teach respect, honor and being kind to young children! How often do we read about NICE kings? Sadly, not very often. This book is a wonderful addition to any library. I'm so thankful I had the opportunity to read it!